So, you’ve come to Dublin’s fair city, perhaps as a tourist, or to pay your Dublin friends a visit. Maybe you’re attending a convention, but want to extend the fun beyond the convention itself. You’re looking a suitable place to socialize with old friends, or the new friends you made at a convention in Dublin! Or maybe you just need a place to play some casual tabletop games? Well, we’ve got you covered! In this series of blog posts, we’ll show you some noteworthy places in Dublin City Centre’s nerd scene. This week, we’re going to look at three nerd-friendly cafés and pubs that you could try out. If you’re looking for a place to hang out in the afternoon with a cuppa or some caffeine, Accents Coffee on Stephen Street Lower is a lovely little hang out. Order your hot drinks and sweet things upstairs, then take your plate downstairs to sit on one of the cosy little couches huddled around coffee tables. Raid Accent’s own game collection (Connect Four, playing cards, Jenga, Operation, etc) or bring your own games. The only problem is trying to gain the willpower to leave the couches. Another option would be the Tea Garden (disclaimer – not actually a garden!) on Ormond Quay. The staff are very hospitable and knowledgeable about different kinds of teas. They too have a collection of standard card and board games at the front of the shop. This place is even more relaxed and cosy than Accent Cafe, and I very nearly fell asleep during a game of cards the last time I hung out with friends there. The relaxed atmosphere makes this venue a very hushed place, so maybe it’s not the best place for a very loud game of Werewolf or Codenames. Maybe save that for the pub. 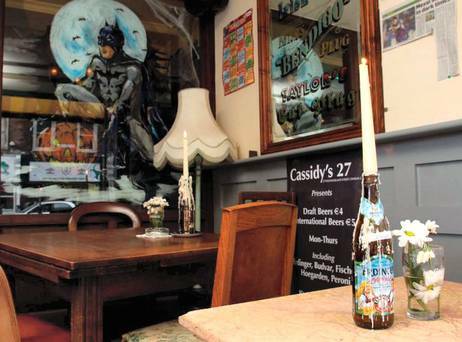 Speaking of which, if you’re looking for more of an evening-time venue, with a few pints for good measure, you could try Cassidy’s Bar on Westmoreland Street. It’s quite central, and does lovely hot pizzas – though you may want to order your pizza as soon as possible if you’re hungry, as it can take a while to get to you when the bar is busy. Be warned, it gets very busy at peak hours of the weekend, and therefore music can get a bit loud. Otherwise, it’s a great venue to play games in – book a table downstairs to reap the benefits of a foosball table and Jenga, in addition to your own card games of course. Plus, they have chairs upholstered in comics, and have an entire wall painted with The Joker’s face (Heath Ledger style). I don’t know about you, but that should count for extra points. It’s a bit dim downstairs though, so if you need to be able to see someone’s cards on the other side of a long table, bring your glasses. I’m Batman! at Cassidy’s Bar. Dublin being, well, Dublin, there’s loads more possibilities out there for social venues. If you’ve been to Dublin before, what’s your favourite place to hang out? If you’re a Dubliner yourself, got any tips on finding the best venues? If you have any additional recommendations, let us know!